I hope you will enjoy looking at it as much as I enjoyed putting it all together. There's nothing more FUN than ICE CREAM.. 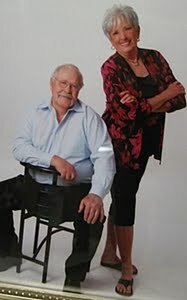 It's a WONDERFUL treat for YOUNG and OLD alike..and especially the OLD with a YOUNG ATTITUDE !! What's a chicken doing here ?? from THE LITTLE RED HOUSE...that's the one that's run by our friend, MARY....I filled it with the faux PINK flowers that I love so much..
SHELIA..can you REALLY love Faux Pink Flowers ?.......Why, you bet your little "don't have to water 'em", you can !" I have used my BLACK and WHITE many...M.A.N.Y. times thru the years of blogging. 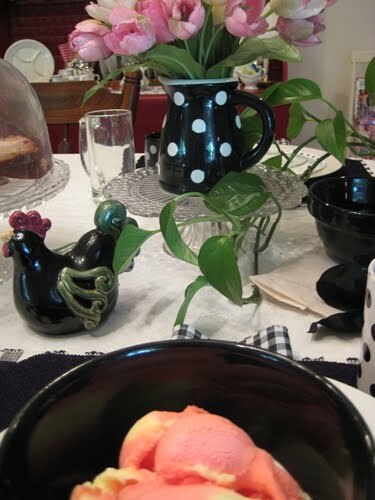 I really don't have all that many dishes..
inspirational and just down right FUN BLOGLAND parties..woo hoo ! We really love it so it's always a treat for us.. I try to keep one in my freezer at all times !!. Would you just look at that silly little black rooster....eyeballing that cake ! .....coffee, ICE CREAM and cake !! at our market last week. and thanks to everyone for coming by MY place. Oh BJ, I so adore you and love reading all your wonderful posts :) Your settings always look so darn cute and it makes me just want to pop down to your place and have girl chatty time :) Love the black and white and the pink faux flowers, love it!! Have a great day Sweetie! Mmmmm. Everything there just seemed to hit the spot. Ok, the shot of the rooster eye-balling the cake is too funny! Love the black and white-enjoy! Ohhh, BJ, this is fabulous ... so where's the ice cream?!? I love your ideas ... know what I'm tying around my cake stand dome ... Such a fun festive setting. Pop by for our GIVEAWAY ends Sun. Cherry & lemon sherbert...ooooooh! I have to look for that! I love anything with lemon in it! 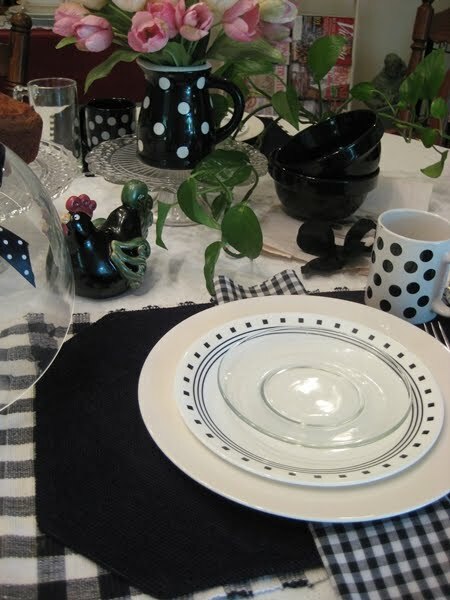 Love all your dishes, the B&W polka dots are perfect for this! Have a 'cool' weekend, BJ! It's always fun to come to your house. Maybe somneday I'll just surprise you and show up at your doorstep. Wouldn't that be fun!! Yummy!!! Black and Pink is amazing! I always love your polka dots and black and pink are perfection! Hope you have a great weekend. Good morning BJ, I love your black and white. Pink faux flowers are the best kind. They last all year and always look pretty. Most of all I love coffee ice cream. There was a time I wouldn't touch it. Thank good goodness I have mended my ways. Smile. We are leaving for our week in the mountains with our kids and grands. Good times! My daughter came a day early and last night we made nearly 30 jars of jam. We laughed at all the jam and swore we would never do that again. HA! But we will, when the fruit is free and so plentiful. Lets see, peach, cherry, black raspberry, fig, plum, and blackberry. I will be posting it. Smile. Mmmm, sweet and cold sounds wonderful today. It's hot! Cherry and lemon sherbert? Yummy! I love your dishes! Happy Pink Saturday, BJ! I always love my visits to you and reading your awesome Posts! Great dishes! I agree with you about sherbet, it's my favorite too!! I love it even more today, BJ ... just had to take another peek. Oh my this cake looks delish! 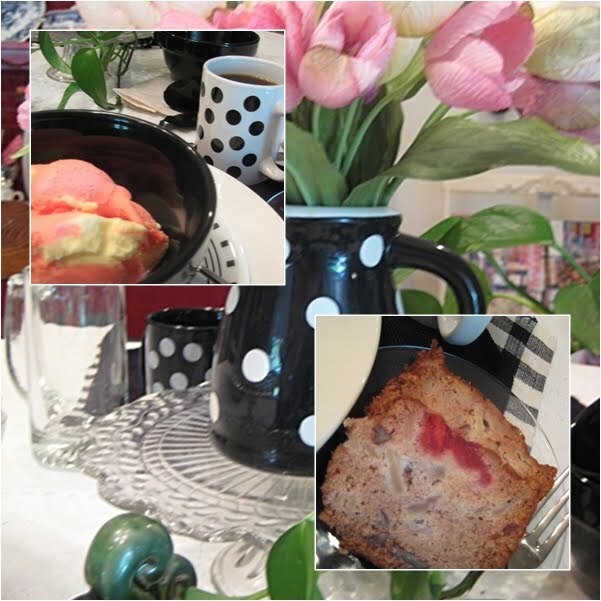 I would love to come for coffee, and a piece of that yummy cake. Your table looks so pretty too! I'm hungry now! Happy Pink Saturday! I love ice cream as well, but cannot eat too often. Not good for a little problem I have. My mother used to make homemade. None better. My favorite is Blue Bell Homemade Vanilla. I would not know how to eat it out of all those fancy dishes you hare. Love the polka dots!!! They make my heart happy! And so does your earring saying at the top of your blog! Have a lovely Saturday! I just love the black, white and pink!! And everything looks so tasty!! My mouth is watering and a am drooling all over my keyboard!! This post has it going on! What's to be bad about ice cream? 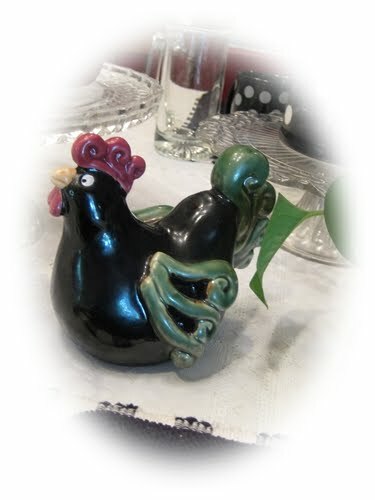 (absolutely nothing) and love the charming table settings...and fun chicken. A great post. I love the black, white and pink colors together. Your cherry and lemon sherbert looks good. And the cake looks yummy! I think I just gained back the 4 lbs. I recently lost...just from looking at your post! We love homemade ice cream, especially PEACH from our GA peaches. 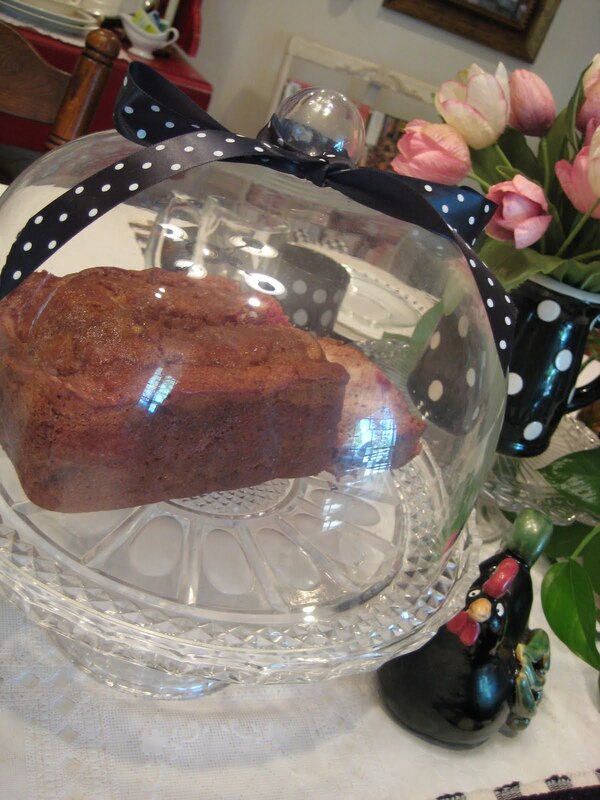 I use my husband's grandmother's old recipe and there is none better! Also love, love black, white, & pink...and polka-dots??? Oh, my! I am amazed at how many followers your blog has! I can't imagine ever getting that many. If I ever make it to 100 I'll dance a jig! You do a great job with yours! What a beautiful table you set! Love the black and white and that cake sounds delish. Thanks so much for joining me for the Ice Cream Social! Its so much fun to see what everyone comes up with. It's all so delightful...the table setting, the happy music, the ice cream, and the cake, too. 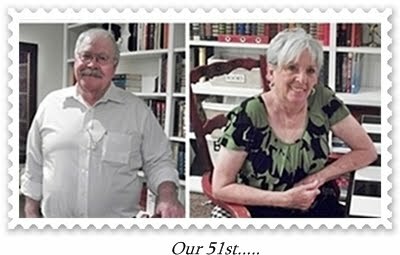 Loved glancing over your sidebar. I see someone I miss a lot, too. 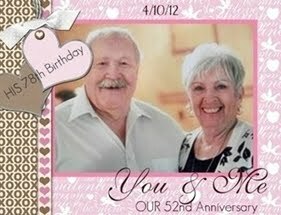 And your anniversary photo is just terrific. What attitude and spark! I haven't seen that flavor of sherbet yet - it sounds wonderful! Beautiful black, white and pink post. Lemon - Cherry swirl sherbert - I agree - YUMM!! 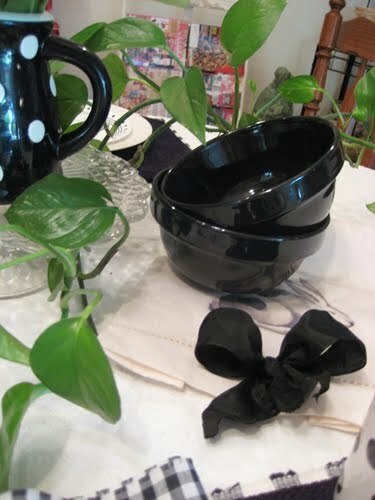 Love all the black & white dishes -quite the collection! BJ, Thanks for inviting me to your Black and White Ice Cream Affair! As usual, being with you is fun! 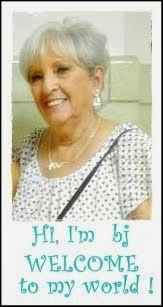 You are such a sweet lady with such a sense of humor and adventure. What I really want to know, how do you eat all these goodies (you seem to cook a lot, and very well) and stay so slim?!! Nicely done. So glad you came to the Ice Cream Social. That was the classiest ice cream social I've ever been to! I love black, white and pink together! What a fun table and I think the black and white with the pink is gorgeous. What a fabulous flavor of sherbet. I haven't seen that one. I better start looking. What a great looking table! So festive and pretty! 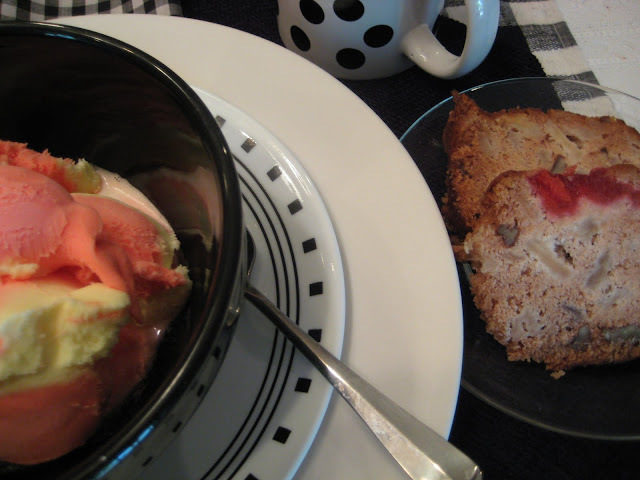 and the loaf with the sherbert looks so good! I want to come to an old fashioned ice cream social:) I love ice cream and your polka dots! Thanks for sharing! Big hugs! Thanks for stopping by and visiting! I hope you like Strawberry Pretzel Dessert! It is Yummy!! I am following you back!! I would like to invite you to join the Over 40 Bloggers Club!! Take a look and join in the fun! Have a wonderful rest of your weekend!! Your sherbet looks delicious! Lovely table too! Oh that looks so good! 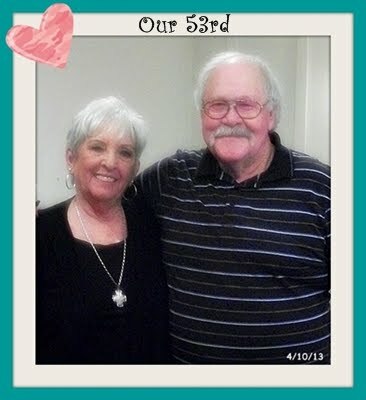 Speaking of looking good... the photo of you and hubby on your sidebar is AWESOME!! You look fabulous darlin'!! love the sherbets.. and the cake looks yummy! Could I have been overlooking that yummy cherry-lemon sherbet in the dairy case? I'm going back to try to find it. 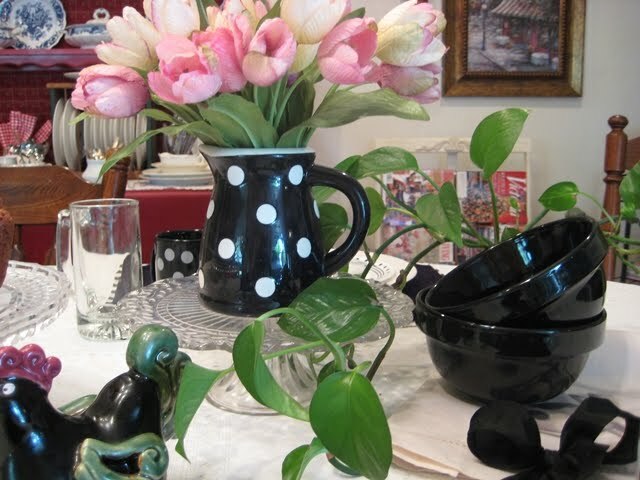 Your black and white table is stunning with the colorful accents you've added. BJ- You have truly made me smile this morning. I love your post! First, your humor is so contagious. 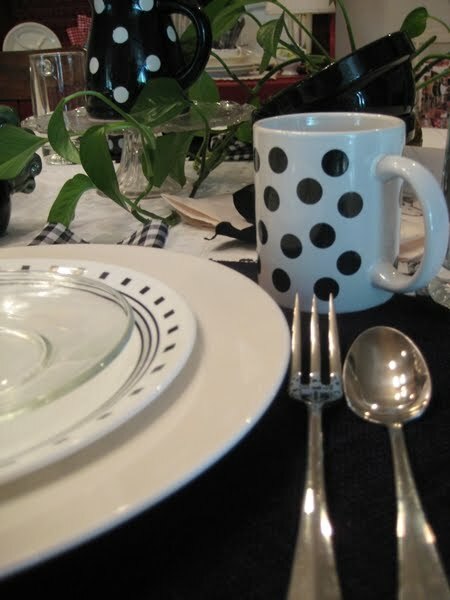 Second... dishes with black and white polka dots are some of my favorite things. (I have that pitcher and use it all the time!) And third...where in the world did you find the sherbet? I have never seen anything but the classic flavors around here. That cake looks so yummy, too. The sherbet looks delicious! Perfect for a hot day like today! Cannoli is an Italian pastry, like a wafer rolled around a tube. You fill it, in my case I used ice cream! I cried when they announced the oil had stopped. Please let it be for good. Happy Pink Saturday, dear friend. The sherbet sounds wonderful! What a beautiful table you set! Love the black and white. Nice to meet you through Suzy's ice cream social. I love the black and white polka dots!!! The sherbert looks delicious! Beautiful color!!! Cherry & lemon sherbet sounds so refreshing for a hot summer day - beautiful post and I love the dishes.